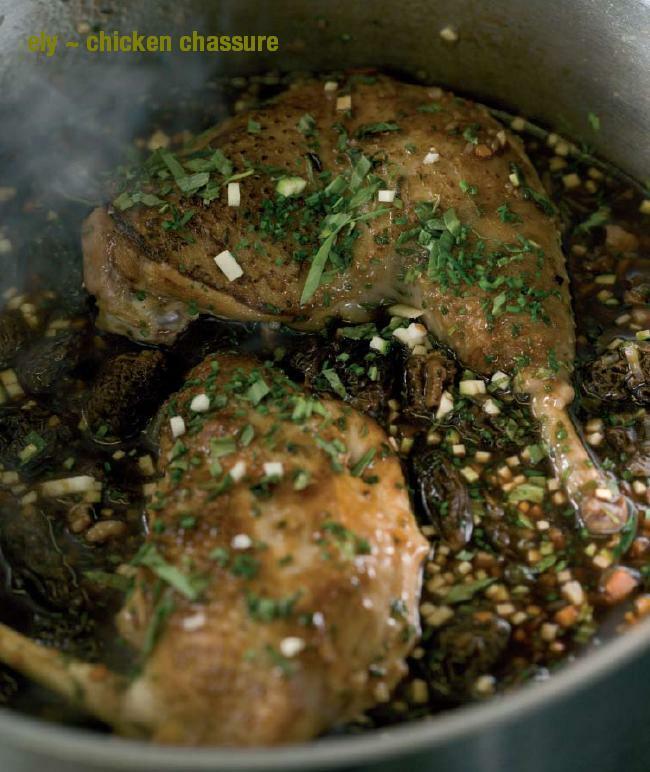 This one-pot wonder is still a favourite at ely winebar. Heat the olive oil in a frying pan, add the lamb and seal on all sides. You will need to do this in batches. Place all the ingredients in a large pot on the hob. Add enough water just to cover and season lightly – remember you can add more later. Bring to the boil, cover and simmer over a low heat for 1 Vi-2 hours until the meat is very tender. It should cut easily – even with a spoon. Taste and season again if required. Serve in deep bowls with traditional brown bread. 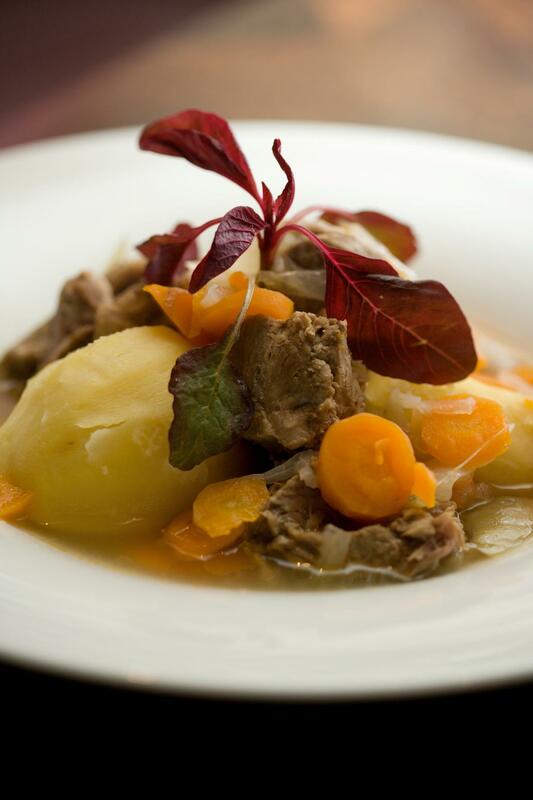 This is a simple dish, with a clear juice and a delicate, sweet flavour from the organic lamb. Lombeline Beaune is a delicate Pinot Noir, with light fruit and tannins that quietly compliment the stew, and with its own sweet berry fruit. 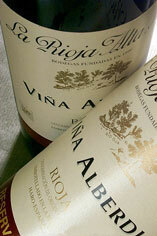 La Rioja Alta ‘Vina Alberdi” Rioja. If you are interested in learning how to cook the ely way you can book a place on one of our upcoming Cookery Courses over the coming year. Serving finer wine by the glass is what we’re all about at ely. We want our customers to be able to appreciate our extensive wine list, experience new and different grape varieties, and become more confident about their wines. This short guide gives an insight into a number of different grape varieties you will find at ely. The noble Bordelais grape has travelled far. Every wine-growing region has its own style of cabernet sauvignon, with its blackcurrant and cedar characteristics. Renowned for its longevity, many of the greatest wines in the world, and many of the simpler ones are likely to have this structured, sturdy, elegant grape variety as at least part of the blend. It demands red meats and strong hard cheeses. A rare old Bordeaux variety. It yields small quantities of exceptionally deep-coloured, full-bodied spicy wines and has now become synonymous with Chile. Hearty steak and game dishes can take this extrovert variety with ease. The Beaujolais grape is paler and bluer than most red grapes, with relatively high acidity and a simple, but vivacious aroma of freshly picked red fruits. Shows best drunk cool, and recommended with cold meats, flowery-rind cheeses such as Brie and Camembert and pastas and pizzas as well as many chicken dishes. Once popular in Bordeaux but now more readily associated with Cahors in South West France and more so with Argentina, where the varietal produces lush wines with gamey concentration and ageing potential. Perfect with barbecued or seared dishes. A vigorous vine planted over much of central Italy, but most widely in the Abruzzi where it is responsible for the often excellent Montepulciano d’Abruzzo, and in the Marches, where it is the principal ingredient in such reds as Rosso Conero and Rosso Piceno Try it with Italian dishes or, indeed, because of lowish acidity, it can complement some spicy Asian cuisine. The king of Italian grape varieties, the deeply layered ‘tar and roses’ bouquet and complexity on the palate cry out for powerful meaty dishes, especially beef and veal to draw out the flavours Preferably open a few hours before use, or at least decant if possible. It is the ultimate foil for both white and black truffles. Pinot noir is arguably the greatest of fine wine grapes and makes the fabulous red wines of Burgundy with scent, flavour, texture and body unmatched anywhere. A particularly old variety, the vine is difficult, only moderately prolific and often less than happy in some of the newer parts of the winemaking world. However, New Zealand, the South of France and some New World regions are getting to grips with it and producing some very different, fruity but worthwhile wines. Roasts, game and washed-rind cheese shine with this grape. South Africa claims this variety as its own. A cross between pinot noir and cinsault it is capable of making fruity, easy-drinking wines alongside some serious and very stylish wines. Great for outdoor dining and winter stews and roasts. Sangiovese, and its synonyms, are Italy’s most planted variety. 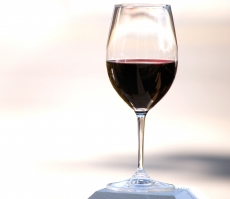 It is the principal variety for the fine red wines of Tuscany, such as Chianti, Vino Nobile and Brunello. Wines made from this grape have noticeable tannins and acidity but a character that varies from somewhat earthy to plummy according to quality and ripeness. Great with lamb, pork, bacon and hard cheeses such as pecorino or parmesan. And of course, pastas and pizzas. Syrah is the great grape of the northern Rhone; the deep, dark, dense qualities of the wine are characteristically strange and satisfying. Scented with black pepper, capsicums and sometimes violets, the grapes flourish in warmer climes such as California, Australia and South Africa, where it is known as shiraz. Tempranillo is Spain’s answer to cabernet sauvignon, the vine variety that puts the spine into a high proportion of Spain’s most respected red wines. Its grapes are thick-skinned and capable of making deep-coloured, long-lasting wines that are not, unusually for Spain, notably high in alcohol. Lamb, chunky vegetable dishes and manchego cheese are perfect partners. Originating most likely in the Adriatic, this exotic black-skinned grape, grown predominantly in California, can make dark, brooding wines for barbecued steak or bizarrely, sweetish, lighthearted quaffing rosés called ‘blush’. Native to the north-west of Spain and Portugal (Rías Baixas and Vinho Verde) this satiny, round variety gives a very refreshing match to the wonderful seafood of the area. The winemaker’s ‘artist’s palette’, chardonnay can take on many styles, depending on its provenance and the winemaker’s intentions. From cool, classic Chablis, through creamy, fruity unoaked Mediterranean offerings to huge, oaky, tropical, fruit-filled New World giants, it can be all things to all men, and, according to Bridget Jones, women! Match the style to the dish, oysters and seafood for the austere Chablis, Pacific Rim dishes for the whopping Australian styles. Probably the world’s most versatile grape variety, it is usually found in light and fruity New World wines, particularly from South Africa where it is known as steen. It also produces some of the finest longest-living sparkling, dry, medium and sweet white wines in the Loire Valley and Limoux. 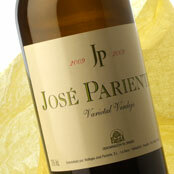 Perfect with river fish, goat’s cheeses, chicken and fish dishes with creamy sauces and fruit, honey and nut desserts. The classic white of Austria, this is a hidden gem, The wine is capable of beating top chardonnays in blind tastings, yet is little known here. Somewhat spicy and unusual in style, it is full-bodied and very savoury, and suits a wide variety of quite strongly flavoured dishes. The twin grapes of the northern and southern Rhône and the Languedoc, this pair make a sturdy, very full-bodied, bone-dry and spicy wine that will withstand most dishes, especially those with strong flavours such as truffles. The ‘grapiest’ of all varieties, muscat comes in every style from bone-dry, through low-alcohol and lightly frizzante, to full Spumante, and even sweet and sticky. It is the base of many good Vin Doux Naturels such as Muscat de Beaumes de Venise or Muscat de Rivesaltes. The muscadet grape (or Melon de Bourgogne) is almost solely grown for producing the dry, crisp white wines from the Nantes region of the Loire. The perfect foil for shellfish such as crab, lobster or prawns. Although its base is Burgundian, it is more common in Alsace where plantings have increased. It is also to be found in Italy where it yields simple but popular fresh, fruity wines. A good wine to match many varied dishes. This grape tends to give flavourful, almost oily wines, rather high in alcohol and slightly low in acidity. More spicy in France than Italy or Argentina, It is full-bodied enough to accompany red meats if red wine is not used. Cultivated all over North Eastern Veneto, especially Valdobbiadene. It renders a sparkling wine with delicate aromas of apples. Widely used as an aperitif or simply to quaff and watch the world go by. A great white wine grape associated most obviously, but not exclusively, with Germany and Alsace. It varies in style from the light alcohol wines of the Mosel in Germany through full-bodied classic wines of Alsace to the stony, lemon and lime ripeness of Australian Riesling and wildly aromatic New Zealand styles. The grape can show hints of green apples, lemon or white peach when young, with the typical kerosene bouquet developing with age. Ideal match to ham and pork dishes, strong cheeses, onion tarts and quiches. An exceptionally fine white grape, distinctively aromatic, it is responsible for some of the world’s most popular white wines. Sancerre, Pouilly Fumé and Menetou-Salon, for example, in France and a host of Sauvignons and Fumé Blancs from elsewhere. New Zealand Sauvignon is now considered a classic style. The perfect thirst quencher, it works with so many dishes. Blended with its traditional partner, sauvignon blanc, this golden-berried vine variety is the key ingredient in both the great dry and the sweet white wines of Bordeaux. Sémillon usually predominates and inspires rich, golden, honeyed viscous wines. It can also be used on its own or blended with chardonnay, mainly in hotter countries. Well-matched with rich fish dishes like monkfish or turbot, or poultry with cream sauces. A very low-yielding variety with a particular perfume of peaches and blossom. A relatively drought-resistant variety, it is now thriving in the south of France and is also grown in the New World. Blended with chardonnay at times, it is an intriguing mix. Drink as an aperitif, or with some lightly spiced dishes. This article has beinig taken from the ely cookbook, which is available for purchase from any of the three ely restaurants or can be purchased online. ely’s BIG tasting is a fantastic opportunity to taste over 80 wines from across the globe. We open up wines from across the globe and have experts on hand to guide you through the tasting. Whether you want to explore the great wines of the world or simply enjoy the wines you love, our BIG tasting is great way to taste your way through as many or as few wines as you like. Open your mind, your nose and mouth to wine at the ely wine club. We run ely wine tastings, wine appreciation courses, wine nights, all in that friendly, no nonsense ely way. Our line up of cookery classes with wine and food matching continues for 2012! Why not treat your mother to a night of forgotten favourites in Irish cooking, where we put a modern twist on the recipes you grew up with! Our Executive Head Chef will demonstrate how to cook the perfect 3 course Easter Sunday Dinner for all the family, and our award winning sommelier will taste you through the ideal wines to serve with it. Our expert pastry chef, Montacer Mansour will teach you how to create those mouth watering chocolate desserts, that will have your friends and family owing and aahing!! Ian Brosnan, our sommelier will present an evening on the tricky task of pairing cheese and wines, focusing on what works best, and why! Some foods are so good for you they are classified as ‘super foods’. In this cookery class we’ll take a look at the super food category and teach you some delicious and interesting recipes for them. How to entertain the little ones and parents without stress! Healthy quick bites for all, with of course a lesson on ‘what wines we love’ by Ian Brosnan, for the Big people only! This excellent class on selecting, preparing and cooking fish is ideal for those who would like to gain some confidence in cooking with fish in the kitchen. We’ll also give you a lesson on the matching wine with fish and fish based dishes. With both the Euro finals and the Olympics this summer, our BBQ class is the perfect way for you to prepare for a summer of entertaining friends at home! Our class will include preparing meat, fish, vegetables and marinades for the BBQ to give you the wow factor, followed by super wines for a summers evening. Thought America was only famous for beef burgers? Think again! At ely’s USA night we’ll teach you a repertoire of fun and funky dishes from across the American continent, we’ll finish the evening off with a lesson on American wines and beers. To make a booking or for more information please contact Ian cookclub@elywinebar.com, call 01 678 7867 or visit our website. The ultimate in wholesome comfort food. Start by sweating the onion in half the butter in a pan. When the onion is translucent, slowly add the flour to make a roux. Over a very low heat, stir in the white wine and 500ml of the cream. Add the fish and crab meat and cook for 12-15 minutes. Meanwhile, preheat the oven to 180°C. Cook the potatoes in plenty of boiling, salted water until soft. Drain and place back over a low heat covered with a dry, clean cloth for a few minutes. This will help to dry them out a little. Mash the potato with the remaining cream and butter, to taste. Season well with the salt and pepper and set aside. Add the dill and parsley to the pan with the fish and crab meat, and season with salt and pepper. Turn the seafood mix into a large, ovenproof dish and cover with the mash. Brush the top of the potato with the egg yolk. Bake for 7-10 minutes, or until the potato is golden brown on top. This is a great dish to cook for a casual weekend dinner or Sunday lunch. Best of all, most of the work can be done the night before. Just work through the recipe right up to the point where you assemble the pie, then cover and put in the refrigerator overnight. All you have to do the next day is bake the pie for 15-20 minutes at 180°C. Broglia Tenuta la Meirana’ Gavi de Gavi. 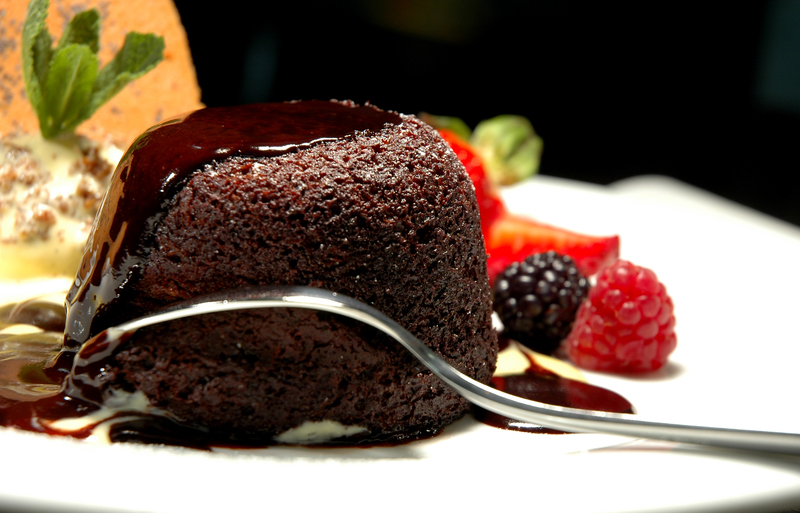 A melt-in-the-mouth dessert for chocoholics everywhere. Put the chocolate and the butter In a heatproof bowl and stand over a pan of simmering water. Leave to melt, stirring until smooth. In another bowl, whisk the eggs, egg yolks and sugar together. Add the melted chocolate mixture and fold in the flour and cocoa until evenly combined. Lightly grease 6 x 7.5cm ramekins with butter and dust with cocoa. Stand them on a baking tray and pour in the chocolate mixture until about three-quarters full. Place In the fridge for 1 hour to set. Preheat the oven to 200°C. Place the ramekins into the oven for 10 minutes. The fondant should be spongy on the top but still soft in the middle – you can check by gently inserting a small knife and the chocolate mixture should run free. Serve the fondants warm with a scoop of vanilla ice-cream or mango sorbet and a thin dessert biscuit. At ely, we like to serve this dessert with a refreshing mango coulis. powerful finish. The concentration achieved by the grenache, and the heat and time works well with the chocolate, especially dark chocolate. A red Zinfandel, from California. A modern twist on an old French classic. At ely, we serve this with creamy mashed potato. Start by soaking the morels in boiling water until thoroughly wet and soft to the touch. In a large pot (big enough to hold the chicken), sauté the carrot, shallots and celery in half the butter until al dente. Add the thyme and bay leaves and then a splash of red wine. Strain the morels, roughly chop and add to the saucepan with the vegetables. Add the stock and reduce to a simmer. Heat a frying pan and fry the chicken pieces in the remaining 50g of butter until golden brown on both sides – this will add flavour to the dish. Place the chicken pieces in the simmering liquid. Add the cream and reduce by one-quarter. Season to taste. Chop the tarragon leaves and add at the last minute – this ensures that you don’t blacken the herb with too much heat and also brings out its full flavour. Serve in a bowl, on a bed of mashed potato, scattered with the spring onions. A light merlot-based wine will bring out the flavour of the mushrooms. Chateau Calon from Montagne, Saint-Emilion, has dark fruit, ripe, rounded tannins and a decent finish. Le Volte from Omellaia in Bolgheri, Tuscany. 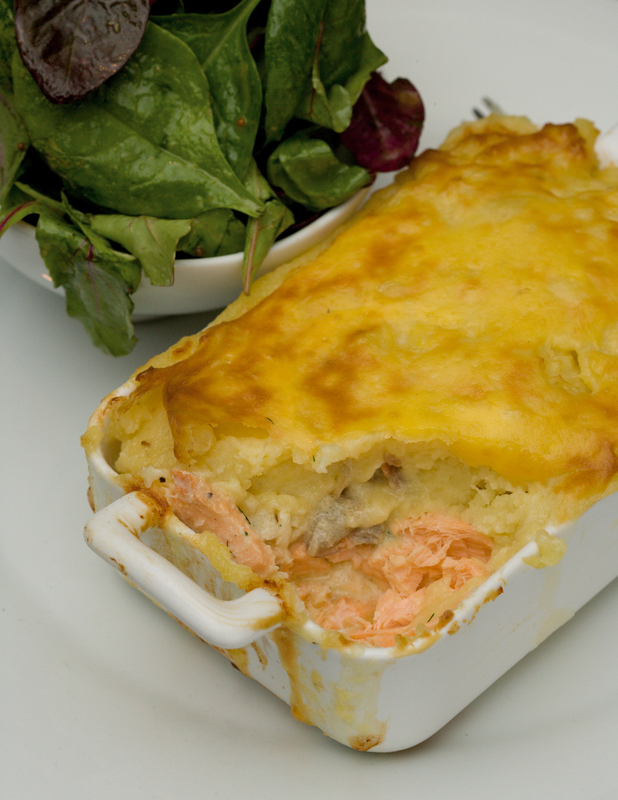 This recipe is taken from the ely Cookbook – available for purchase for €20 online.